February is Teen Dating Violence Awareness Month, a national effort in the United States to raise awareness about abuse in teen and 20-something relationships and promote programs that prevent it. Because everyone deserves a safe and healthy relationship. 89% of college students report that they are not confident in their ability to recognize the warning signs of dating abuse. Explore the 10 signs of an unhealthy relationship (and 10 signs of a healthy one) from One Love Foundation. 1 in 3 teens in the U.S. will experience physical, sexual or emotional abuse by someone they are in a relationship with before they become adults. If you work with youth: equip yourself! DATING MATTERS is a free, online 60 minute course that walks through warning signs and consequences of teen dating violence, as well as ways to promote healthy relationships. • The National Domestic Violence Hotline provides support, crisis intervention information and referral services in more than 200 languages. Empowering teen girls is a crucial part of the battle against relationship violence. Learn more about Leagues across the Association working to promote youth self-esteem and healthy relationships below and on our blog. The goal of JLLB's Confidence & Me program is to empower at-risk 5th-8th grade girls and boys to develop healthy relationships based on self-confidence and respect for themselves and others, learning life skills such as communication, conflict management, leadership, goal-setting and anti-bullying strategies. These events are designed so attendees can participate throughout their middle school experience. Our goal is to develop ongoing relationships and interactions with students throughout their journey during these formative years, providing them a toolkit of resources, knowledge and skills. Positively More is a program for 11 and 12 year-old girls that takes a positive approach to youth development and builds upon the many strengths of adolescent girls. When young girls exhibit self-confidence and resilience and feel supported by an array of adults, they are more likely to set high educational goals, express strengths such as self-discipline and engage in activities that are beneficial to their physical, social, emotional, and intellectual development. This project gives girls the tools to navigate sticky middle school situations, lessen the escalation of conflicts in personal relationships, and apply lessons learned through role play. The Junior League of Northwest Arkansas strives to prevent further acts of domestic violence through education the community, increasing awareness of domestic violence, communicating information and resources, and empowering the community to end domestic violence. 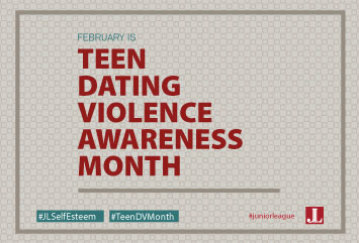 Check out their amazing Pinterest board full of resources and information on teen dating violence. MAGIC provides mentors to young women detained in the local juvenile detention center who await sentencing or admission into a treatment program. MAGIC is the only comprehensive project of its kind for incarcerated young women in the state of Florida. Through twice monthly programming, JLGO volunteers nurture the self-esteem of MAGIC participants by providing support, encouragement, and educational services. Sessions cover enriching topics such as women’s health, bullying, self-esteem, mental health, career options, domestic violence, nutrition, and human trafficking. The Junior League of Austin reaches out to Hispanic girls and their mothers to ensure the girls continue their education following high school by going to college or serving in the military. The program has had a 74 percent success rate. From budgeting and credit cards to body image and self-defense, The Junior League of Rochester’s GIRLSrock! program tackles all the issues facing at-risk teenage girls. The Junior League of Pensacola creates the Steppin’ Out program to mentor girls who are aging out of the foster care system with education and advice on applying for jobs and college, personal finance, health, etiquette, and arts and culture.